RMRU is always looking for new members! 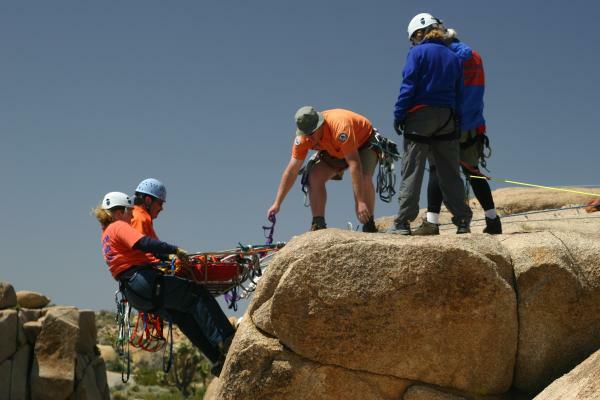 Thank you for your interest in joining Riverside Mountain Rescue Unit. We are an all-volunteer, non-profit team of rescue professionals who are always looking for qualified people to join our team of dedicated rescue members. 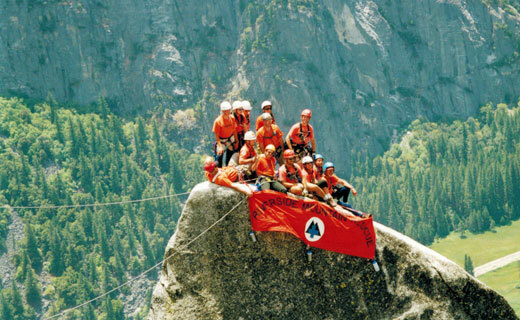 As a member of the Mountain Rescue Association, we are not your average search and rescue team. 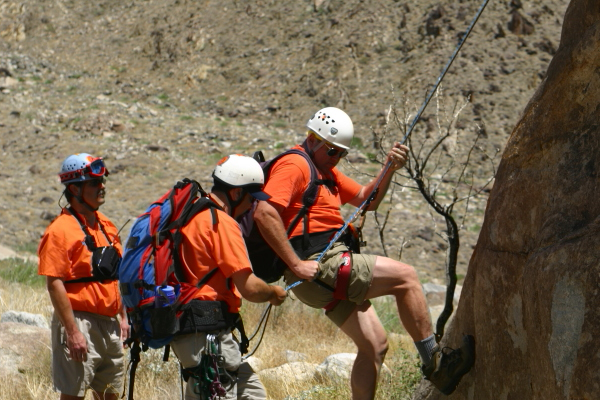 In addition to what is expected of most SAR teams, we specialize in high-angle rope rescue and extended back country and mountain rescue missions. If you think you have what it takes to be part of an elite mountain rescue team, read on. The team meets at 7PM the first Wednesday of every month at the Sheriff's Office Valle Vista substation at 43950 Acacia Street in Hemet. This is one block south of Florida at the corner of Fairview and Acacia. Email info@rmru.org ahead of time to make sure there will be someone out front to meet you. RMRU is a group of volunteers trained and ready to respond to wilderness emergencies. At any hour of the day, law enforcement agencies, national park or military officials may call upon us to aid an unfortunate victim. We are on constant alert to search for and effect the rescue of hikers, skiers, rock climbers and outdoors enthusiasts whenever and wherever tragedy strikes. 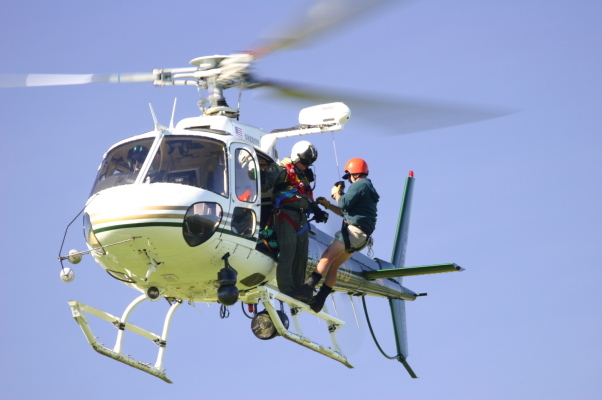 We perform about 95% of our missions in Riverside County. We have, however, traveled south into Mexico, north into the Sierras, and into Nevada on search and rescue missions. We are comprised of over forty volunteers who literally come from all walks of life. We regularly leave our jobs (or, in the middle of the night, our warm beds) to respond to a call for help. Each member must provide all of his own equipment and we receive no remuneration for time given to search and rescue. The members make up a small but spirited group of mountaineers who spend one weekend each month training to sharpen our skills. Beside acting as highly competent rescue workers, we also work closely with school, clubs, church groups, and Scout troops throughout the area to teach mountain safety. Our members have been honored nationally for their contributions to wilderness survival education. With RMRU, teamwork is key to everything we do. We are not simply a group of individuals, but an integrated team. We train as a team so we can perform as a team. It is only through dedicated teamwork that we can be successful in saving lives, something RMRU has been doing for almost five decades. We train as a team, we work as a team, and we socialize as a team. The ideal applicant would be an accomplished mountaineer with years of experience in mountaineering, climbing, and back country survival. Rarely does anyone like this apply. 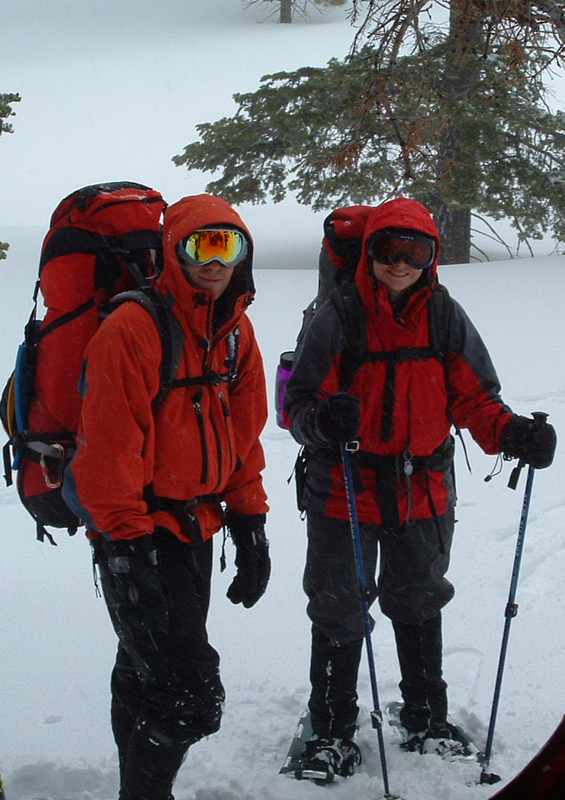 The more experience you have in backpacking, hiking, climbing, or mountaineering, the better. At a minimum, you should be a very good physical shape. While we don't have specific requirements for existing skills in new applicants, we are a mountain rescue team, and this implies that the team has certain skills and abilities. You should be able to backpack overnight and be comfortable spending a night in the back country. RMRU does not teach basic hiking and back packing skills, you should already have these skills. You will be expected to actively train for certification within the team in the areas of search and tracking, technical rock rescue, and technical snow/ice rescue. Consider if you are up to the physical and mental challenges of this type of training. The most important things we look for in applicants are a genuine enthusiasm for the outdoors, a desire to help others, a willingness to learn physically challenging skills, and the resources (both money and time) to actively participate on the team. Do not underestimate the commitment of money and time. Members pay for all of their own gear, though we do get discounts from some manufacturers and many members will loan or sell old gear. You need not buy all the necessary equipment at once, though by the time you have been on the team a couple of years you will likely have spent thousands of dollars on gear. Do not underestimate the amount of time you will have to dedicate to be an effective member of the team. We meet one night per month, train one weekend per month (usually including an overnight trip), and average several missions per month. Be realistic about your ability to spend that much time away from work, family, friends, and other personal endeavors. Will your personal and professional life allow you to be away for 50+ hours per month? Will your boss support you leaving work for rescue missions? In addition to the amount of hours you will be expected to spend with the team is the timing of those hours. Unlike training, missions are not scheduled conveniently on weekends. They often come at the worst possible time: When you are asleep, in the middle of family meals, the middle of the workday, during children's birthday parties, and quite often on holidays which you would otherwise spend with family or friends. Again, be realistic about your willingness and ability to break away from whatever you might be doing to respond to missions. Talk this over carefully with family and significant others. Make sure they eagerly support you before committing yourself to being a member of RMRU. All that being said, we are also also looking for fun people to be around. 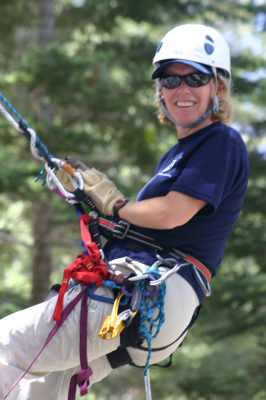 We are a fun-loving group of outdoor enthusiasts and want new members that will fit well within our SAR family. New members will be expected to attend some new member trainings to get a basic idea of how the team works and learn about equipment that they will need to become a fully active member. There will be 4 meetings that you have will be attend. Meeting #1: Personal Equipment Inventory and RMRU Euipment Familarization. Evaluate personal equipment and see what is needed to be mission ready. Go over RMRU equipment in the vehicles and how to use the team radios. Meeting #2: Trailhead Familiarization. Drive to and meet at revevant trailheads that RMRU is regularly sent to. Take GPS coordinates at each location and discuss the environment that you would encounter in each area. Meeting #3: Physical Fitness Evaluation. This will be a timed hike to Saddle Junction from Humber Park with a full overnight pack. Meeting #4: Sheriff's Driving Class. This class is run by the Sheriff and goes over driver safety, insurance issues, and procedures if you have an accident. There is no driving evaluation. We will also go over how each RMRU vehicle operates and how to properly store them. Upon completion of the Initial Training for New Members, you will have been exposed to a little of what RMRU does and its equipment. But there is still special training involing Helicopters, Snow and Ice, Technical Rock, and Tracking Skills that you will have to learn. This is just the beginning of your training. Team members train monthly to learn new skills and keep old ones sharp. RMRU is constantly training. RMRU invests a great deal of time and effort in training new members. That is a big commitment on our part. What we ask in return is a commitment on your part to attend all regularly scheduled team training for your first two years on the team. You will be asked in your interview to verify your intention to attend all training for your first two years. If you don't think you can commit to this amount of training, perhaps you should reconsider joining RMRU. The potential new member must attend a monthly meeting, request an application, and return the application to the New Member Coordinator. The potential new member must attend an interview set up by the New Member Coordinator once he/she receives and reviews the potential members application. Once the potential member passes the inital interview, his/her application needs to be approved by the RMRU Board of Directors (BOD). After BOD approval, the New Member Coordinator will give the potential new member a Sheriff's Volunteer Background Application. This application must be returned to the New Member Coordinator. Once the background check is approved, the potential new member will be fingerprinted and interviewed by the Sheriff's Liaison. Finally, upon Sheriff's approval, the potenitial new member becomes an RMRU Training Member. A RMRU Training Member: Person fully accepted as an RMRU member. Must attend 6 missions, 9 trainings, and 9 meetings per year. Training Members are to respond to all missions they are available for. At the mission it will be up to the Operations Leader, the Field Team Leader, and the Training Member to decide if the Training Member is allowed to go into the field. NOTE: Potential New Members should continue to attend monthly RMRU pre-meeting trainings and meetings throughout the application process. Again, thank you for your interest in joining RMRU. More information on the team, write-ups on many of our missions, past newsletters, and the history of the team can be found on our web site at www.rmru.org. If, after carefully considering all the above, you are ready to join a great team of mountain rescuers, you need to come to a team meeting and meet the team.